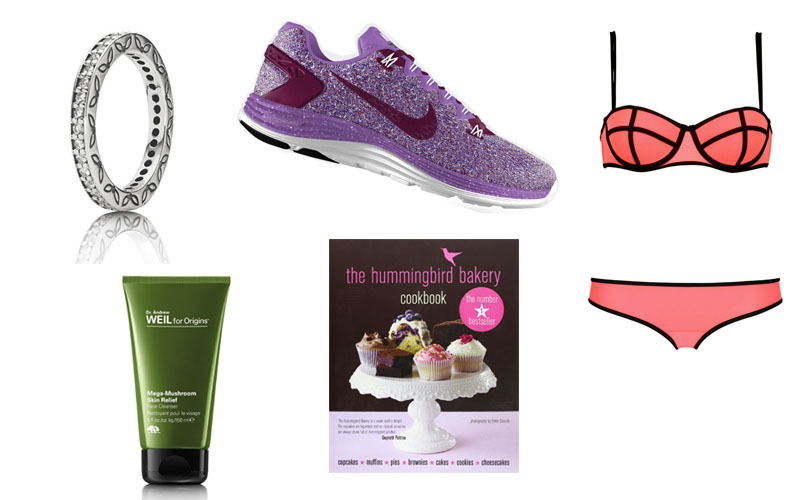 Seeing as next week is my birthday (Friday the 4th to be exact ;) I thought I would share a few of the bits I have on my birthday wish list and general wish list, even if I don't get any of these (it's very unlikely I will get the Nike trainers and bikini) I will probably end up buying them anyway! I already own almost every single Pandora ring there is, once you get one, you just need them all! They are the perfect rings for stacking which I why I tend to buy them as they look great together! I recently spotted this really simple but pretty ring and quickly added it to my list, it also comes in other colours but as diamond is my birthstone I thought the zirconia would be perfect! I usually ask for this cleanser at birthday and christmas as it's my all time favourite cleanser, it's the only cleanser that I continue to repurchase. It doesn't make my skin feel dry or tight like a lot of cleansers I've used before, I have a lot of love for Origins products! Just look at these trainers!! *insert hearts in eyes emoji here* As soon as I saw these trainers I just fell in love, purple is one of my favourite colours and I just completely adore these!! The last time I got trainers was a few years ago (I'm just trying to come up with excuses and trying to justify why I need these beauties) so I totally need new ones! ;) You can also personalise these and get your name/initials/a word embroidered on these, SOLD! Although I can't cook, I like to thing I can *sort of* bake. I love baking cupcakes and have been meaning to go to one of the Hummingbird Bakeries for ages, so would love to try out a few of their recipes! Apparently there is also other recipes like brownies in here too! I swear everyone and their mother either has a bikini/underwear from Triangl or is dying to get some. I follow their instagram account and it really isn't helping with my obsession with their products! I love the look of there Lucie range of underwear (and all their other products!) and this colour is beautiful! PS. Pleaaasee could you guys like this photo on Facebook (link here) for the Trek America contest, I know their are better photos but it would make my year to win!! You also have the chance to win a goody bag if you like the pic! Those trainers are gorgeous! I've been looking around for some new Nikes, I was already struggling to choose and now these ones have been added to my list of possibilities. Hope you have a great birthday!